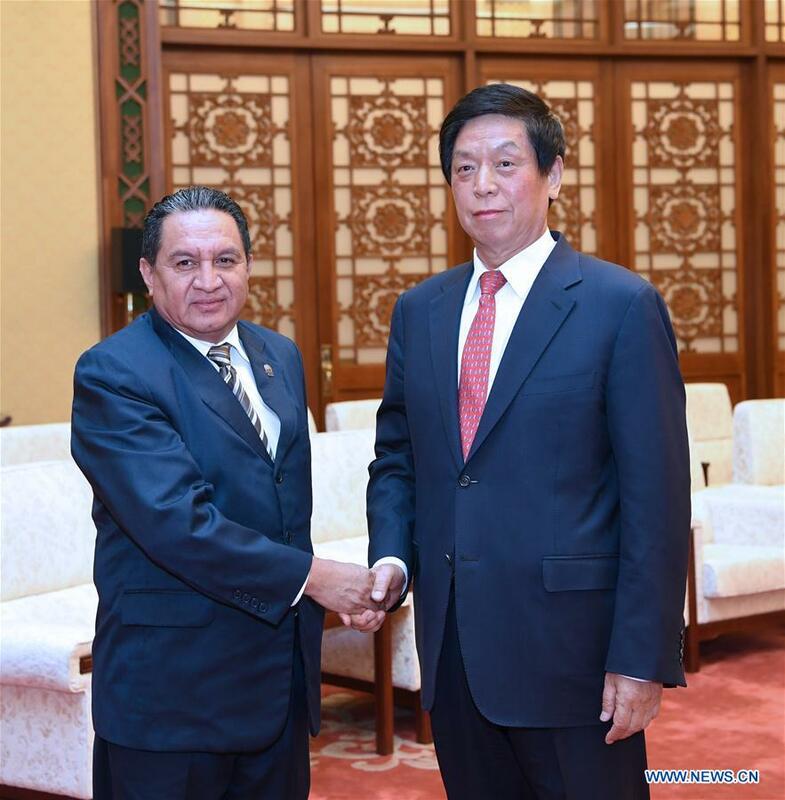 BEIJING, April 15 (Xinhua) -- China is willing to enhance cooperation with El Salvador to promote the healthy and stable development of bilateral ties, Li Zhanshu, chairman of the National People's Congress (NPC) Standing Committee, said here Monday. During his meeting with Jose Serafin Orantes, the first vice president of the Legislative Assembly of El Salvador, Li said the government and the people of El Salvador last August chose to recognize and abide by the one-China policy and became the 178th country to forge diplomatic ties with China. Li said such a choice was a historic one. History will prove that China is a trustworthy friend of El Salvador and the establishment of diplomatic ties accords with long-term interests of the nation and the people of El Salvador, said Li. As the largest developing country in the world, China has a will to help the vast majority of developing countries speed up development, said Li. He called on El Salvador to grasp opportunities to enhance cooperation with China in the principle of mutual respect, equality and mutual benefit. The NPC is ready to intensify exchanges with the Legislative Assembly of El Salvador to contribute to ties between the two countries. Orantes said the Legislative Assembly of El Salvador will use the visit as an opportunity to further strengthen ties with China's NPC and help promote bilateral ties.